Smashburger hooked me up with a sample of their new Ahi Tuna Sandwich for the Lenten season. So I decided to film myself enjoying the sandwich for your viewing pleasure. Smashburger, the restaurant restoring greatness to the American burger, is now doing the same for the often humble fish sandwich. Available exclusively in six of Smashburger’s San Diego locations for a limited time, the new Smashburger Ahi Tuna Sandwich features a sushi grade Ahi tuna steak, grilled to medium rare perfection and served on an artisan multi‐grain bun with fresh baby spinach, tomato, mayonnaise and a drizzle of teriyaki. It’s what every tuna sandwich inspires to be and an entirely different experience than the square, battered and fried filets of fish offered elsewhere. Smashburger guests can enjoy the new sandwich build, or build their own with any combination of Smashburger toppings, or add a seared Ahi tuna steak to a Smashburger Salad. Swim fast. 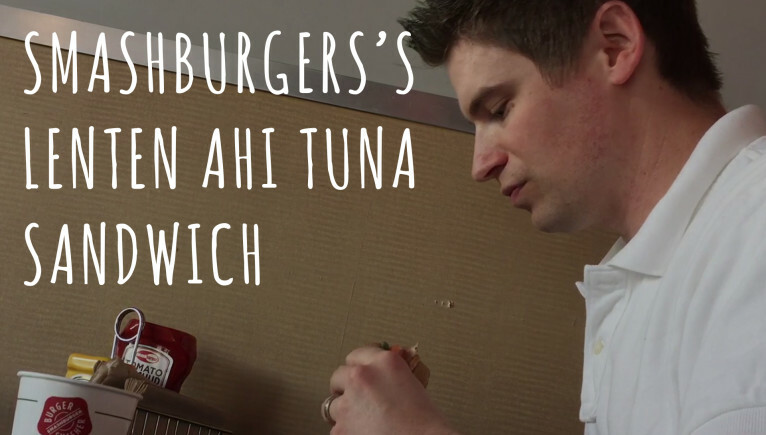 The Ahi Tuna Sandwich is at Smashburger only until April 26, 2016.